There is a place in New Mexico where you can sled down the hill of white sand. Differently from your normal beach sand this one is composed of small particles of gypsum, not quartz. We get here a day after a rare rain so dune surfing does not work that well, but we don’t complain. The view is stunning. A lot had to happen in the geological terms for all this to be possible. Rob, the ranger guiding the sunset stroll, patiently explains formation of the basin skillfully navigating between ignoring and entertaining 3 preteen boys. The rest of the group listens more appreciatively. White Sands are located in a huge Tularosa Basin with no outflow. Water from the surrounding mountains brings minerals in and evaporates. Huge crystal structures that form on the bottom of drying intermittent lakes are broken down by wind and friction and carried over the valley. When the chips become small enough they start forming dunes which make their way through the desert at a rate of 30ft (10m) a year creating ever changing landscape. The grains are getting finer and finally they are permanently airborne and leave the basin as silt and dust. Apart from the geology the park has an unusual protector. The millitary owns the area around White Sands and uses it as a missile range. From time to time they just close the park and the highway 70 to conduct tests. It seems inconvenient but it’s actually a blessing. Because of that there is no construction around. And no-one can pump out the water from the aquifer beneath, which provides nice wet gypsum fundament to keep the entire area from being blown away. The remoteness helps: gypsum is heavily mined in other places of the world. Here it is ready to use waiting on the surface. But commercial mines that were established in early 20th century went bankrupt: no railways and no good roads made it too expensive to get it out. Quite a few plants and animals survive in the dunes. Sometimes they are close cousins of their desert kin: whiter, bigger, better at conserving water. Plants adapted by quickly outgrowing the encroaching dunes. 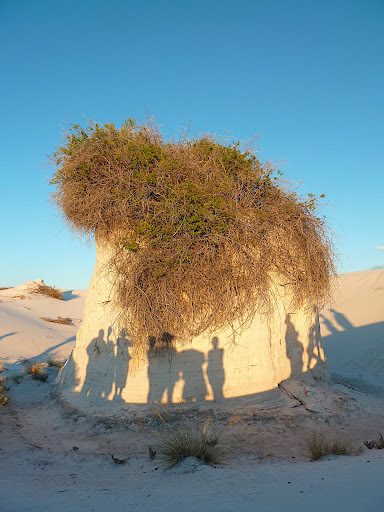 When the dune passes the gypsum held by their roots forms pedestals used by other plants and by animals. Rob tell this story enumerating countless evolutionary adaptations. He does not actually mention Darwin or his theory by name. And he does not explain how the lizards get whiter here. It’s not like they consciously decided to be white: it’s just that lizards that were darker got eaten more often. Apart from the amazing views this is like a lesson in an evolutionary biology. We stick around after the sunset and walk back to our cars chatting with Rob. It quickly becomes evident why NPS is such a great agency. They manage to attract bright, knowledgeable and dedicated people. And nice thing about being on a trip like ours is that people we talk to are at first envious, then interested, and then they offer a list of things we still need to see. Rob gives us several tips on New Mexico and California where he’s from. I ask if he tries to avoid using the word evolution or natural selection. After all he did go as far as to call White Sands an American Galapagos, but I can understand he would not want to provoke a religious freak if one was in the audience. He says for him it’s self-evident that adaptation means evolution. For me it is as well, but I suppose that for some of his listeners it might not be. It is a bit like talking about Solar system without mentioning gravity. Or like talking about cars without touching on engines.Natalia on the other hand thinks that creationists don’t really venture into national parks. At some point the facts may be too hard to ignore, even for people who are skillful at practicing make-believe. Although according to the theory of cognitive dissonance human capacity for self-delusion is seemingly endless (Jonah Lehrer of Frontal Cortex provides a nice example). Sun sets in an express subtropical manner. When it gets darker White Sands are not white anymore. The Sacramento mountains shed the shades of pink and violet and finally disappear into black skies. I look up and see more stars than I ever thought possible. In face of such wonder the existence of people who choose to stay ignorant in the name of their narrow beliefs does not bother me anymore. There are at least two incredibly cool things to do when in Carlsbad Caverns. And somehow - by sheer luck and happy timing - we manage to strike both. The first is to see the bats flying out. The second - to walk down the natural entrance to the big room - preferably alone. Bats flying out for the night of hunting are so spectacular that park service has built an amphitheater around the cave entrance. On Saturday evening there are so many people that we nearly give up. But we stay and endure the interpretive part. It’s not like we don’t learn couple of useful facts but the show is fine tuned to keep kids interested and public is invited to participate. The two things that guarantee I’ll be mortified cringing in embarrassment. The ranger somehow holds it together through questions like: how do bats give birth if they are hanging upside down? And: what happens if bat mom needs to give birth while flying?